Q1: What is the Sisip Sakahikan Community Development Trust? A1: The Sisip Sakahikan Community Development Trust (SSCDT) was established as an unincorporated, non-profit organization through Band Council Resolution #2014-2015-045 on January 29, 2015. All activities of the organization are overseen by the Indigenous Gaming Regulators, Inc.
Q2: What is the purpose of the Sisip Sakahikan Community Development Trust? 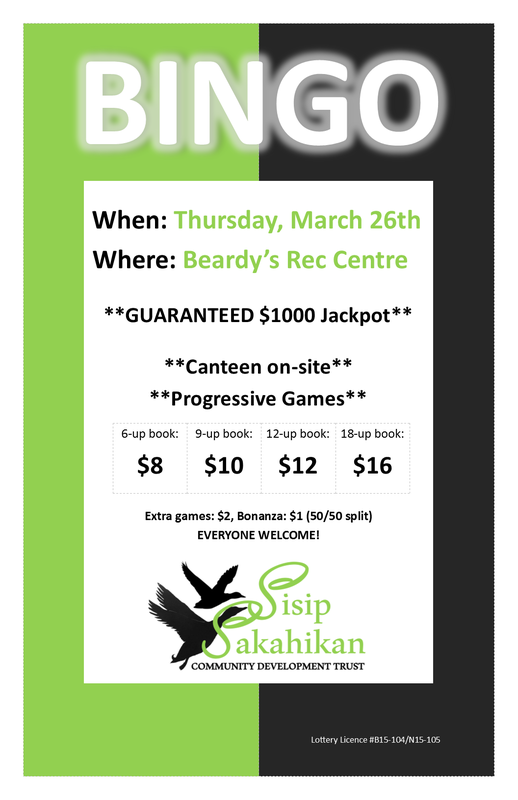 A2: The purpose of the organization is to enhance and support community initiatives and organizations by generating revenue through on-reserve gaming (bingos etc). Q3: What will be done with the revenues from on-reserve gaming? A3: As an unincorporated, non-profit organization operating within the Beardy’s & Okemasis First Nation, the SSCDT is responsible to equitably distribute all the funds generated to community organizations and individuals. Q4: Who will receive the funds? A4: Any individual or community group/association that meets the criteria for eligibility will be able to apply for funding. This process will be detailed later as the Board of Directors establishes these processes. Q5: How do I/we know if I am/we are eligible? A5: Funds will be distributed according to 4 priority areas (PERC): 1) poverty and its reduction; 2) education and its advancement; 3) recreation and its promotion; 4) community and general benefit to our members. Q6: When will funds be distributed? A6: The Board of Directors will establish all the deadlines as it relates to both the application for and distribution of funds. Q7: What is the Board of Directors responsible for? A7: The Board of Directors of the SSCDT is responsible to ensure that all on-reserve gaming it conducts adheres to the policies set forth by the Indigenous Gaming Regulators. The SSCDT is also responsible for the development of policies to ensure the equitable distribution of revenues to community individuals, and groups/associations. Q8: Who does the Board of Directors report to? A8: The Board of Directors is responsible to report all revenues to BOTH the Indigenous Gaming Regulators, Inc., and the membership of the Beardy’s & Okemasis First Nation on an annual basis. Q9: Who can be a member of the Board of Directors? A9: Membership may be granted to any individual who supports the purpose of the organization, agrees to abide by the by-laws of the organization, and accepts the responsibilities of membership. There currently exists a President, Vice-President, Secretary, Treasurer, and 2 members-at-large. Q10: Why was the Sisip Sakahikan Community Development Trust established? A10: The SSCDT was established to offset the costs of financial assistance incurred by the Beardy’s & Okemasis First Nation administration. A majority of financial assistance requests received at the Band Office are not eligible under program/AANDC guidelines. Therefore, when and if program funds are distributed for financial assistance, it adversely impacts service/program delivery in our community. Beardy’s & Okemasis First Nation band members pride themselves on their sense of community. They can take pride in knowing that they’ll be supporting hundreds of initiatives – and each other – each and every year. ← No actual environmental damage- whatsoever!